. With this week’s stable release of Chrome OS, we’ve redesigned the apps list experience to make it easier to access your favorite apps and websites. Notably, we made the apps list much more compact, so you can access your apps without interrupting your browsing experience. We also added a search box at the top of the apps list, which you can use like an omnibox to search the web, specific websites, or the apps on your computer. This week’s stable release also includes visual improvements such as a redesigned Cloud Print dialog and the ability to add custom wallpaper (for example, a picture of your cute little morkie). You can now also save files directly to Google Drive, so you can access files later from any device, including Drive on iOS or Android. Under the hood, we’ve added audio support for USB and HDMI, additional sandboxing security features, and many more bug fixes. This is all part of our goal to make sure your Chromebook and Chromebox get better over time. Still looking for a computer to bring back to school? Check out a Chromebook or Chromebox in person at a Chrome Zone near you, in a Best Buy store in the US or a PC World/Currys in the UK. 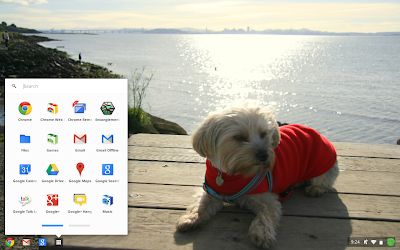 One theme we hear repeatedly from Chrome OS users is how much they enjoy the speed and simplicity of their Chromebooks. With this week’s stable release of Chrome OS, we’ve redesigned the apps list experience to make it easier to access your favorite apps and websites.